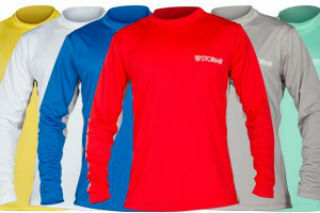 UV Shield Performance Gear is built off of STORMR's reputation for defying the elements. Although many STORMR products are most commonly recognized for cold and brutal weather conditions, the sun and heat of the summer can be just as brutal. STORMR UV Shield Performance Gear is built to keep you cool, dry, comfortable and shielded from the potentially harmful effects of the sun. This line of UV Shield Performance Gear provides fast moisture transfer and evaporative cooling properties while at the same time blocking potentially harmful exposure to extended periods in the sun helping you defy the elements when things heat up.